Thousands of innocent people have been forced to flee their homes as the bombing of Taliban targets intensifies against inside Afghanistan in the "war against terrorism". Bibi is one woman who has fled to the safety of a refugee camp along Pakistan's border with Afghanistan. "The bombs started falling from the sky," she recalls. "My husband ran outside to find our son and then he screamed. I ran to the door. He and my son were lying dead. The rest of us left when the fighting had stopped. We just wanted to get away from the bombs and the killing. " Over seven million people have so far been displaced by fighting and are now searching desperately for food and shelter inside Pakistan. 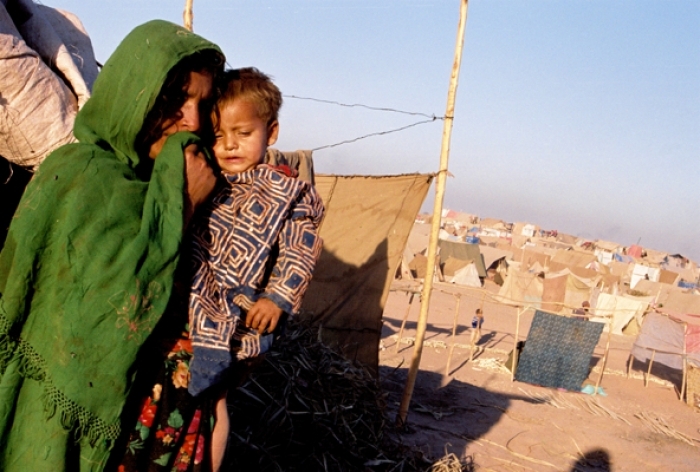 Bibi and her son outside their makeshift shelter in a refugee camp on the Afghanistan/ Pakistan Border near Peshawar. To read this flier, click HERE. If it loads to fit the screen, click on it to view full size. This works on newer Internet Explorer, anyway.